One thing I’ve noticed about Cincinnati and men’s fashion, they take shoes very seriously. Your shoe game almost defines you in this midwest city. Most men here own more shoes than they own clothes, okay this blog post may be getting out of hand, but the point is that if you want to look good and feel great it all starts with your kicks. At Blaine’s, we offer only the utmost comfort and styles. We pride ourselves on being ahead of current trends and making sure you are always looking your best. In order to take care of you guys, we’ve put special attention on our shoe collection. 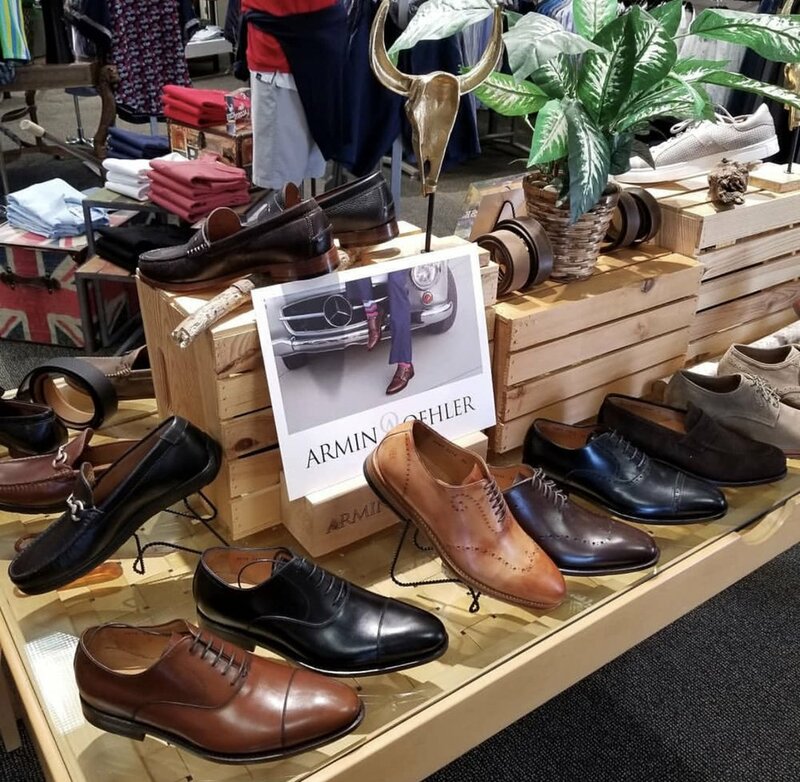 We know you can get a basic sneaker or dress shoe at any store in town, which is why we carry premium European brands that you won’t find anywhere else. These shoes are perfect for a night out with that one buddie of yours who can talk men’s shoes all night long (we all have that one friend). He’ll be shocked when you walk in the restaurant showing him up. Without further ado, let’s get into what makes our shoes so spectacular. If there is one shoe that every man must have in their wardrobe, it’s the Aaron sneaker by Trask. Sneakers have taken over the men’s fashion industry, playing a role in the casual men’s wardrobe and going even as far as being paired back to a suit. These sneakers aren’t just any old sneaker, they are made with luxurious Italian leather and enhanced cushioning for extra comfort and support. Comfort doesn’t mean anything if you don’t look good, and looking good doesn’t go very far if you don’t feel good. These sneakers have it all in one. If you wanted something a bit more dressy, the Trask, “Logan” shoe is just what you need. The Logan is designed with your choice of luxurious Italian calfskin or Charles F. Stead suede. The shoe is made with comfort in mind from the inside out. When we say enhanced cushioning for comfort, we aren’t just talking about an extra pad, we’re specifically talking about a Leather-covered Ortholite®-cushioned footbed. The real thing. The suede boot is so comfortable they may end up taking the place of your slippers. Now if you are like most guys, when you are purchasing a nice pair of shoes, specifically boots, you want the choice of a shoe and belt combo. These boots come with just that! Whether you go with the suede or the leather option, you won’t have to worry about hunting for the perfect belt. For the women or men reading this who didn’t know belt and shoe matching was a thing, now you know! The belt and shoe don’t have to be identical, but the closer you can get to it the better. If you have a brown shoe then absolutely do not wear a black belt and vise versa, there is your daily dose of fashion 101. Now the previous shoes are luxury, style, and comfort, but they may not be turning heads like you hoped for. If you are more of a subtle guy then stick to the sneaker and boot, but if you are a show stopper, I suggest the suede loafer with tassles by our newest designer Armin Oehler. These shoes contain everything the previous shoes had, including premium leather from the calf suede, and natural leather insoles for breathability and lasting comfort. Tucked in the insole is a layer of natural cork providing you endurance and extra insulation. This shoe is a great look to pair with a nice designer pair of jeans and a perfectly fitting dress shirt. The oak tanned leather color is a classic look and great pop of color on your foot. If you’re looking to make a lasting impression and receive compliments all night long, this is the shoe you are looking for. This shoe is a slight investment, but one that will last a very long time. A classic style loafer, with quality leather, and a little flare with the tassles makes it a one-of-a-kind shoe. Whether you need a classic sneaker for everyday activities, a suede boot for a night out, a suede loafer with tassels to turn heads and make an impression or a classic and sophisticated boot for a suit and formal event, we have what you need at Blaine’s. If you live in Cincinnati, Ohio, your shoe collection is dramatically more important than it used to be. With new shoe stores popping up on every corner, there is no doubt there is a shoe market here in town. Stop by our Montgomery, Ohio store and try out the comfort and style for yourself! The shoes just about sell themselves.